The Accident Investigation Bureau (AIB) has urged members of the public to support its probe of last weekend’s Caverton helicopter crash, by availing video footage of the accident. The bureau said the video recordings, among other evidence, would assist the investigators in unraveling the cause of the crash land. 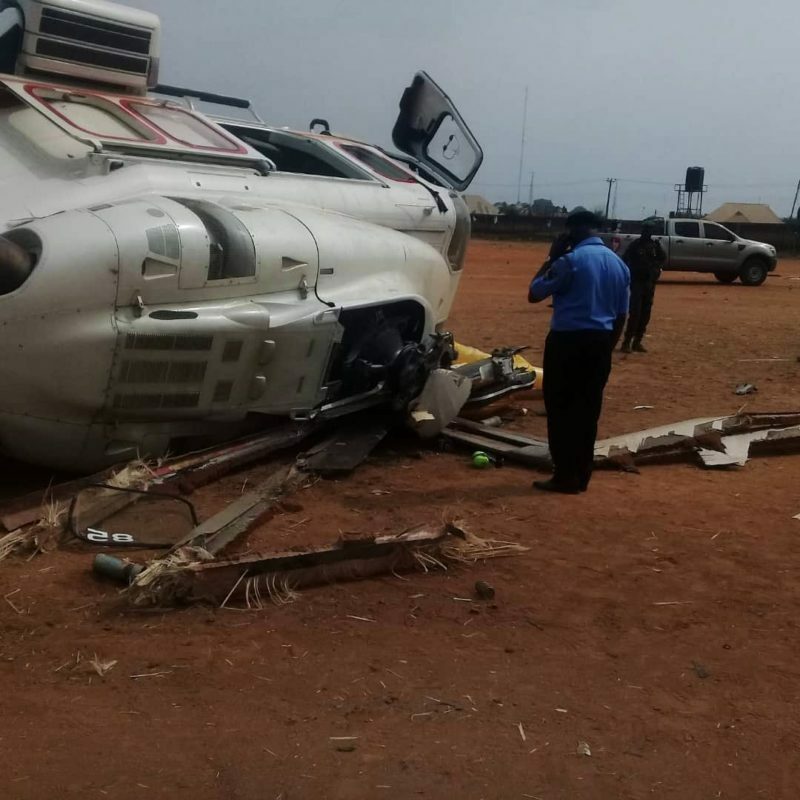 A 15-seater Augusta AW139 Helicopter, under the management of Caverton Helicopter, was conveying the Vice President and his team to Kabba, Kogi State, on Saturday when it crash landed at the arrival ground. While the aircraft, with registration number 5N-CML, was damaged, all 12 occupants escaped unhurt. Commissioner and Chief Executive Officer of the AIB, Akin Olateru, said the AIB needed helps from members of the public. “We want the public to know that we would be amenable to receiving any video clip(s), relevant evidence, or information any member of the public may have of the accident; that can assist us with this investigation. “I am assuring the entire public that this investigation will be detailed, thorough and timely. Accident investigation is not to apportion blame; it is about fact finding and making safety recommendations with a view to preventing future occurrences,” Olateru said. Meanwhile, the Aviation Safety Round Table Initiative (ASRTI) has joined well-wishers in thanking God for sparing the lives of the Vice President and members of his team on board the helicopter. The think-tank group, while waiting for the AIB report of the accident, expressed disappointment on the level preparation made for the landing of the helicopter in that area and the crowd that surged towards the helicopter after the crash. The group, in a statement signed by Olumide Ohunayo, said: “if there had been fire, we would have experienced some casualties given the rush to the aircraft. “We are deeply concerned about the management of security of the Vice President of the Federal Republic of Nigeria. It is embarrassing to see the Vice President being flown by a foreign pilot, whether contracted or chartered, in a Nigerian Police helicopter as noticed in a previous flight during these campaign season. It is a slap on the huge human resource of pilots Nigeria has in abundance,” the statement read in part. Aviation Security Consultant, Group Capt. John Ojikutu (rtd.) said there is valid basis for the use of civil aircraft for presidential duties, once the due safety and security procedure are followed by all the parties concerned. Ojikutu said the incident cannot be treated as ordinary, given that the Vice President is involved. “It is expected that someone left the presidential fleet to go and borrow a civil aircraft. It is also expected that such person should have done due diligence on the flying crew, expertise for that destination, its elevation and temperature since it is an uncontrolled area. “It is not just filing the flight plan, but what information does the crew have about the terrain before take-off? The question now is, did they check that? I’m not talking whether the aircraft is serviceable or not. AIB will sort that out. “But I am talking about the procedure of checking the Vice President out from his house to wherever he is going. In normal places, someone is actually monitoring such aircraft as it flies out. In those days, we always carry mobile towers along all areas the president will fly, especially if it’s an airport or airstrip that is uncontrolled. It doesn’t matter even if he is going to stay for 15 minutes. Everything is done to secure his life. All these things are absent these days and it is very sad,” Ojikutu said.